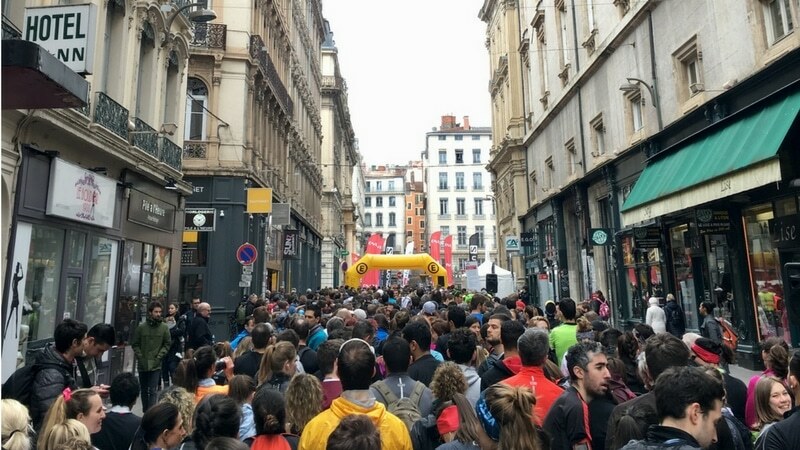 The 11th edition of the renowned Lyon Urban Trail happened on April 1st. So, instead of going egg hunting, Jenna and I went running across the neighborhoods and streets of Lyon. My wonderful colleague, Jenna, and I decided to suffer for Easter Weekend. 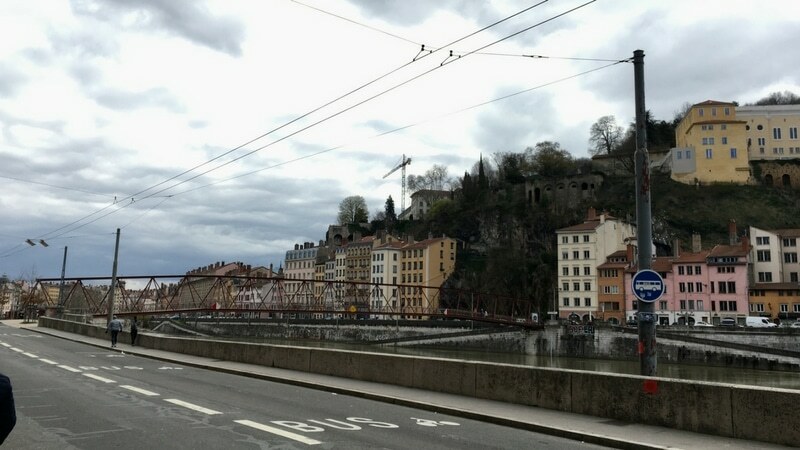 Egg hunting and eating chocolate sounds like a good time for Easter, but discovering Lyon in a new light while exercising a bit is equally interesting. We put on our running clothes and met up at Place des Terreaux, in Lyon’s 1st arrondissement, to race the Lyon Urban Trail. 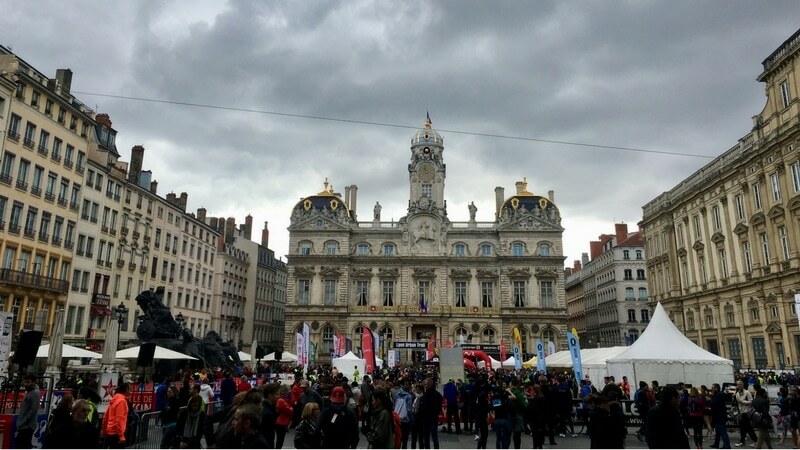 Thousands of runners met up at the Place des Terreaux, in Lyon’s 1st arrondissement, for the Lyon Urban Trail. To put the race into context, the Lyon Urban Trail is the pioneer in urban races in France. 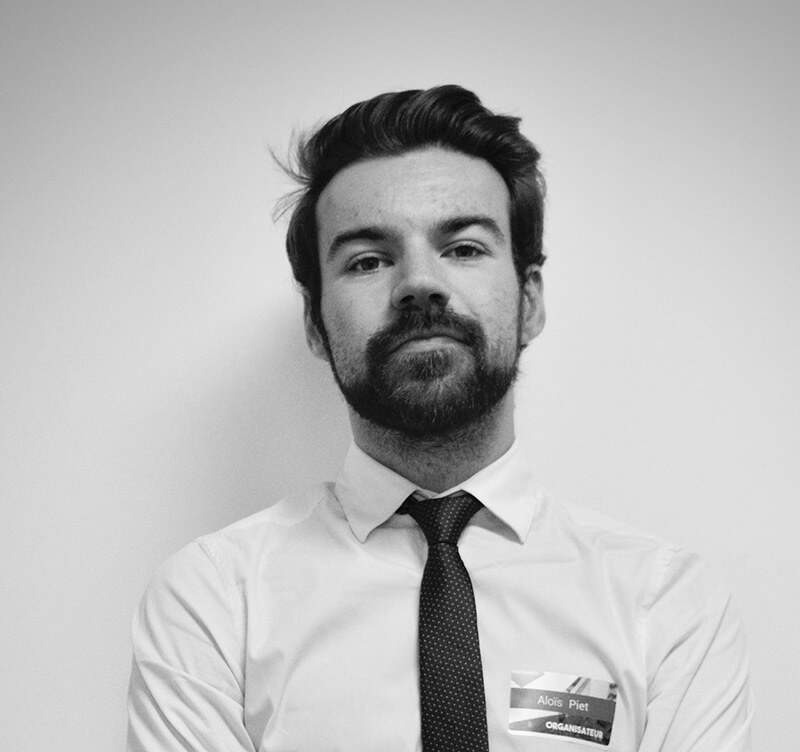 It is, first and foremost, the oldest urban trail and mixes competitive running with a new way of discovering the rich heritage of Lyon’s neighborhoods. As running beginners, we chose to run the 8 kilometer route, but some experts had the chance to choose longer routes of 14km, 23km and 35km. It ended up being a pretty popular idea… as more than 3000 other competitors chose the same distance. A few waves were necessary to let the thousands of competitors start running the Lyon Urban Trail. Jenna and I didn’t have to wait long before breaking a sweat. 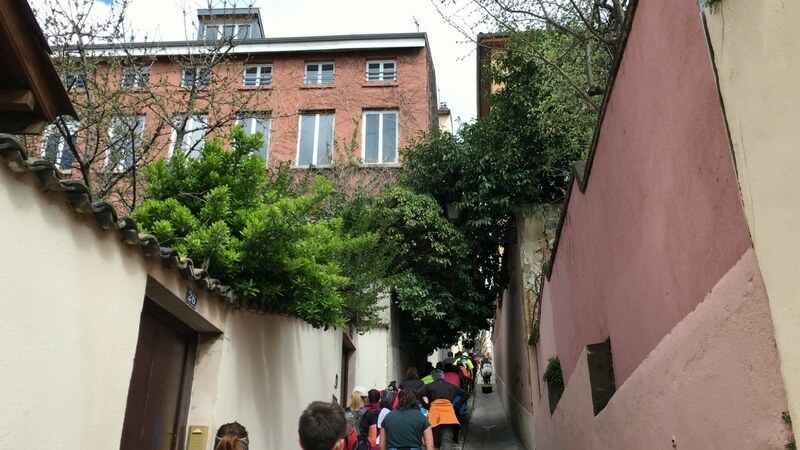 The Lyon Urban Trail took us immediately in the direction of St Paul train station, in Vieux Lyon, to climb up the first stairs of the day. And there were many, many stairs. 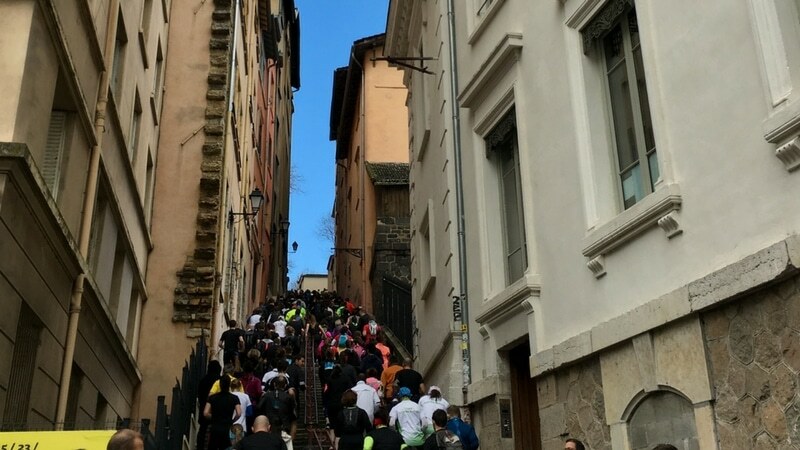 The famous Montée des Carmes Déchaussés, followed by the mighty 800 hundred stairs of the Montée Nicolas de Lange, launched the race with a bang. Fortunately for us, there were so many people packed in the stairways that we were forced to walk. Nonetheless, pretty much everyone had stopped talking at this point of the race. The Montée des Carmes Déchaussés is a stairway linking the St Paul train station, in Vieux Lyon, to the bottom of the Fourvière hill. The 800 hundred stairs of the Montée Nicolas de Lange is one of the most famous ways to reach the top of the Fourvière hill in Lyon. The first standoff with Lyon’s elevation behind us, we caught our breath on our way down to the Saône riversides. The National Conservatory of Music of Lyon was opened exceptionally for us, as well as Les Subsistances on the other side of the river. 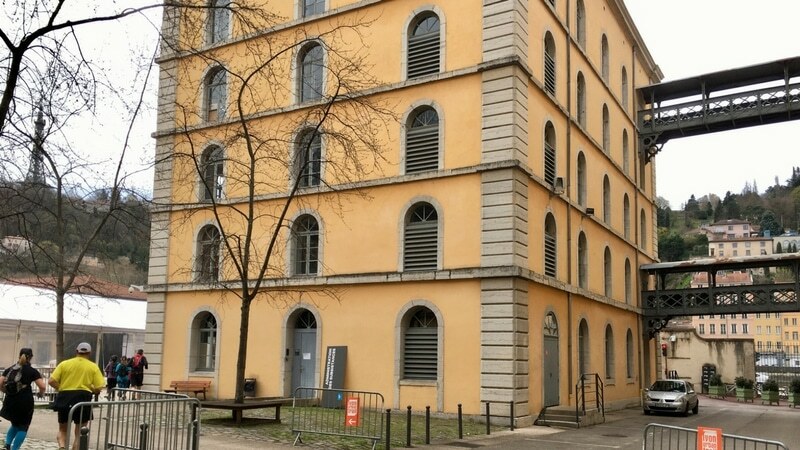 Running through unique buildings in Lyon is what makes the Lyon Urban Trail special. Climbing down stairs is one of the best parts of the Lyon Urban Trail. The Lyon Urban Trail crossed Les Subsistances, cultural center located at the footsteps of the Croix-Rousse hill in Lyon. 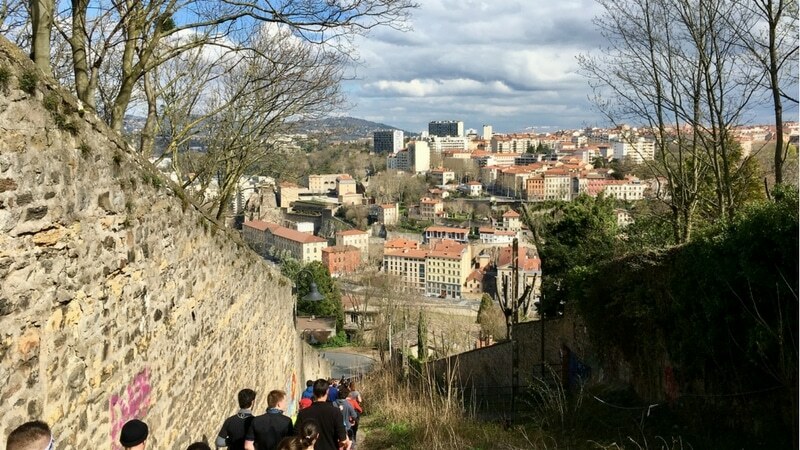 The cultural parenthesis was quickly forgotten when the Lyon Urban Trail made us climb up the Croix-Rousse hill in Lyon’s 1st arrondissement, following a quick run along the river Saône. Stairs navigating through the buildings of the Croix-Rousse neighborhood, gardens attached to the hillside… and fatigue catching up to us. The Lyon Urban Trail offers many beautiful scenes of the city, such as this view on the Passerelle Saint Vincent. 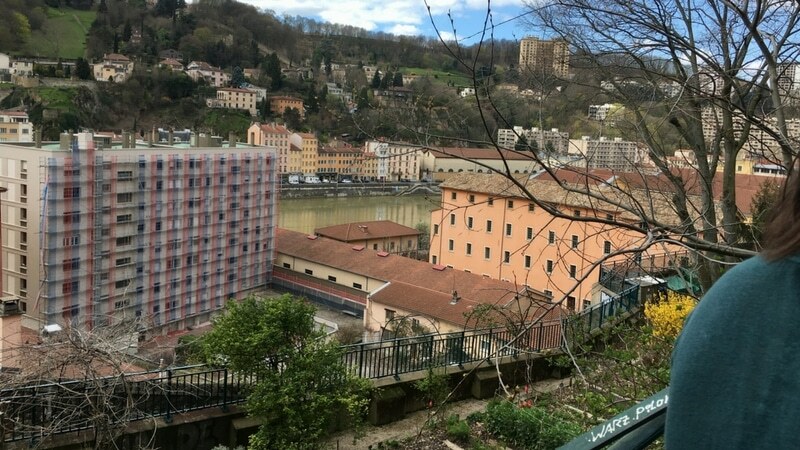 A community garden overlooks the Saône river along the path of the Lyon Urban Train, on the way to the Croix-Rousse neighborhood. There are many stairs along the Lyon Urban Trail route, and most of them are nested between in between buldings. 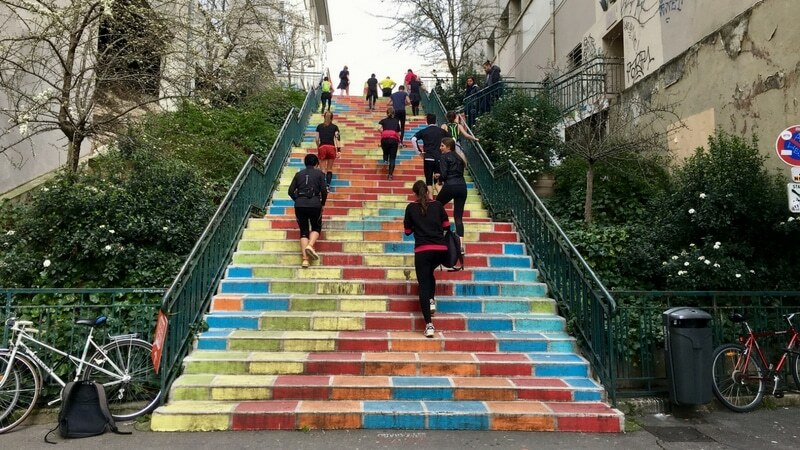 The colorful stairway of Rue Prunelle, in the Croix-Rousse neighborhood, is one of the main attractions of the Lyon Urban Trail. The crowd started to thin out along the steps of the Croix-Rousse. Jenna and I made it to the top of the hill, with the finish line in sight. Cheering from the volunteers and local residents along the route completed the festive atmosphere that represents the Lyon Urban Trail. 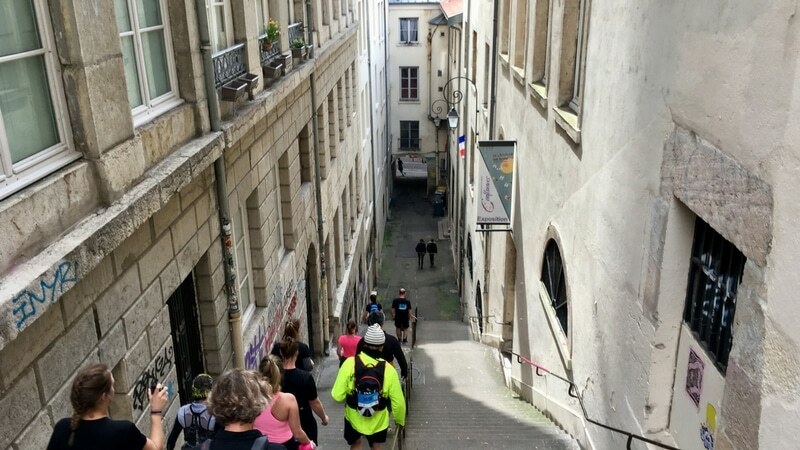 After the pain of the Fourvière and Croix-Rousse hills, the descent on our way back to Place des Terreaux brought happiness to all the runners, some sharing cheers to other competitors along the streets of the Pentes de la Croix-Rousse. 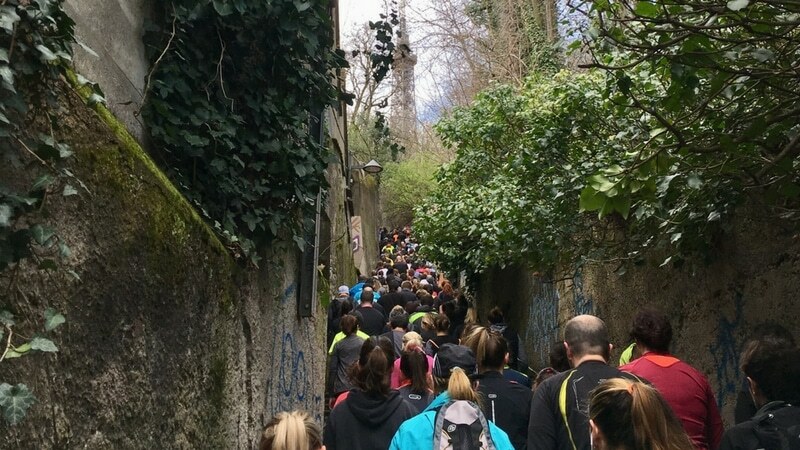 Every runner had to race down the Pentes de la Croix-Rousse to reach the finish line of the Lyon Urban Trail. 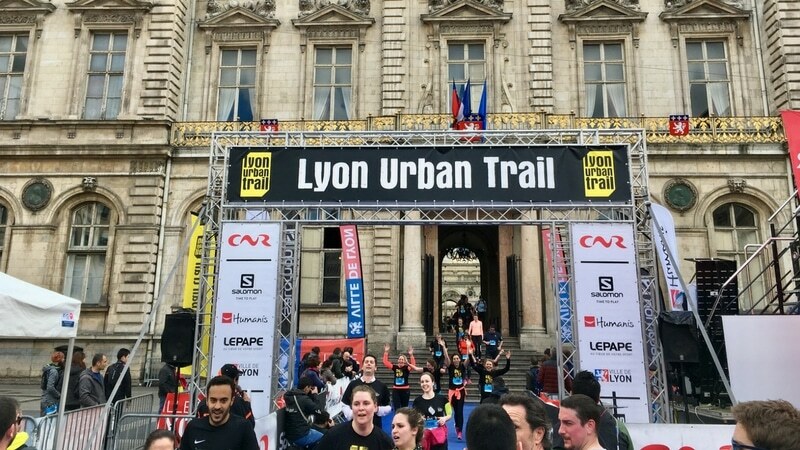 The reward of crossing Hôtel de Ville is the exclamation mark of the Lyon Urban Trail that makes you forget about the pain and the sweat of the race. A large crowd was gathered at the finish line on the Place des Terreaux, greeting all the finishers of every distance. We promised each other to come back next year for the 12th edition of the Lyon Urban Trail, and this time, the 14km. 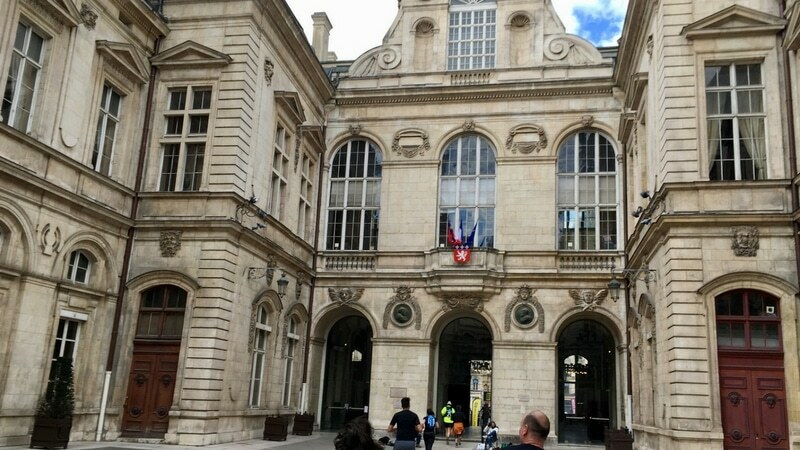 The Lyon Urban Trail crosses the Hôtel de Ville right before the finish line on the Place des Terreaux. The finish line of the Lyon Urban Trail, located on the Place des Terreaux, right under the porch of the Hôtel de Ville.